Further to the launch of the Vito PURE, PROGRESSIVE and PREMIUM lines earlier this year, Mercedes-Benz Vans UK Ltd has announced new engines that are now Euro 6c compliant (previously Euro 6b), alongside the introduction of Mercedes PRO connect and an adjusted look to the instrument cluster. 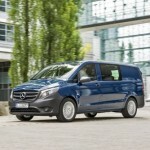 Mercedes-Benz Vans is introducing a series of improvements for its contender in the mid-size vans segment. Among the highlights are high-torque four-cylinder diesel engines for the Vito Tourer with passenger car approval. Mercedes says that in comparison to the predecessor, the new OM 654 engine range reduces emissions and consumption values whilst also optimising noise and vibration comfort. The power units, already familiar from the Mercedes-Benz passenger car range, will see their first ever usage in a commercial vehicle at Mercedes-Benz Vans. Mercedes-Benz Vans has launched its all-new Vito Taxi, which replaces the original model introduced in 2008. Over 3,000 Vito taxis have been sold so far. With three lengths, three weight variants, and two turbodiesel engines in five power ratings, the New Vito offers a broad range, starting from £17,855 (ex VAT) for the 109 CDI panel van Compact.